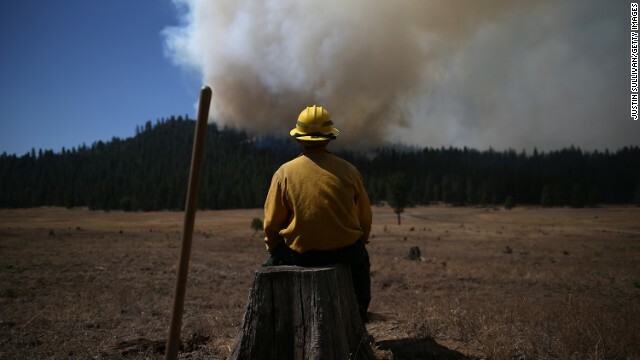 A Hotshot crew member rests near a controlled burn at Horseshoe Meadows as crews continue to fight the Rim Fire near Yosemite National Park in California on Wednesday, September 4. 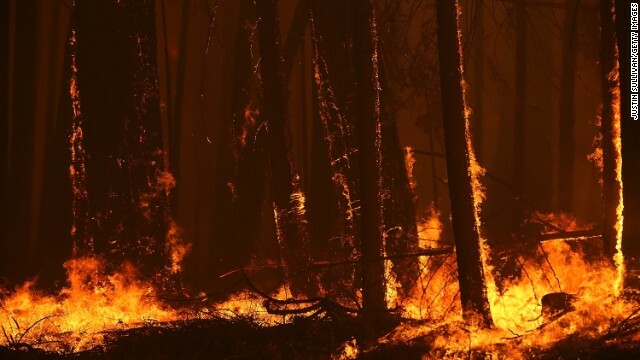 The massive wildfire has burned over 280,000 acres and is now 80% contained, according to a state fire spokesman. 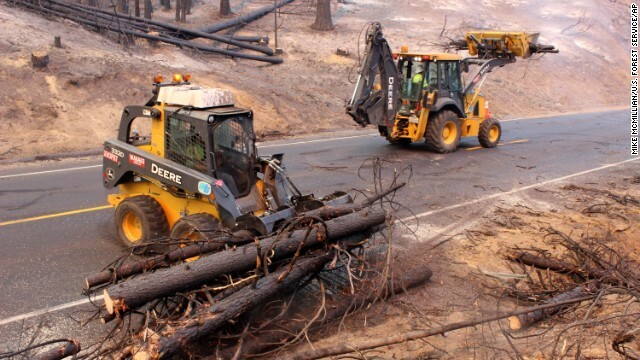 California Highway 120 is cleared of debris as crews continue to fight the Rim Fire near Yosemite on September 4. 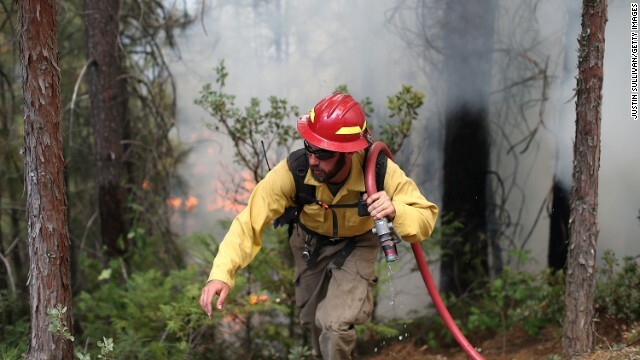 A member of the Bureau of Land Management's Silver State Hotshot crew walks through a burn operation on the southern flank of the Rim Fire on Friday, August 30. BLM Silver State Hotshot crew members perform burn operations on the southern flank of the fire on August 30. 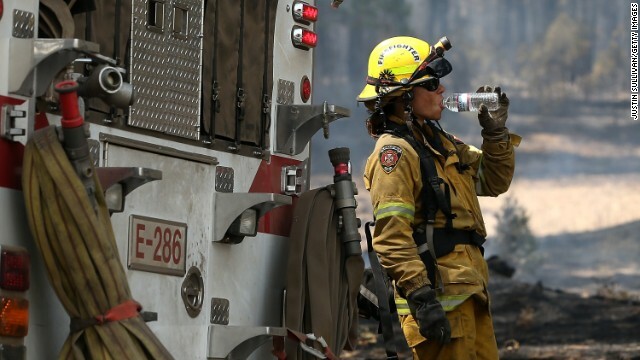 A firefighter takes a break from battling the Rim Fire near Groveland, California, on August 28. Firefighters from Sacramento Metro burn around an old cabin in Ackerson Meadow near Yosemite National Park on August 28. 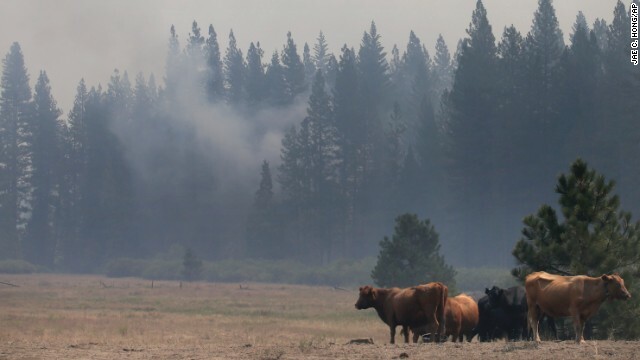 Smoke from the Rim Fire drifts past cattle in a field near Yosemite National Park on August 28. Firefighter Russell Mitchell monitors the situation during the Rim Fire near Yosemite National Park on Tuesday, August 27. A videographer records the flames burning through trees as the Rim Fire menaces Yosemite National Park on August 27. 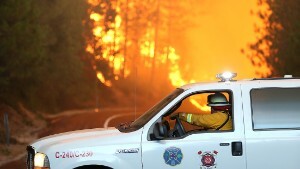 Firetrucks drive through heavy smoke generated by the Rim Fire near Yosemite on August 27. Sacramento Metropolitan firefighter John Graf monitors the Rim Fire line near Camp Mather, California, on Monday, August 26. 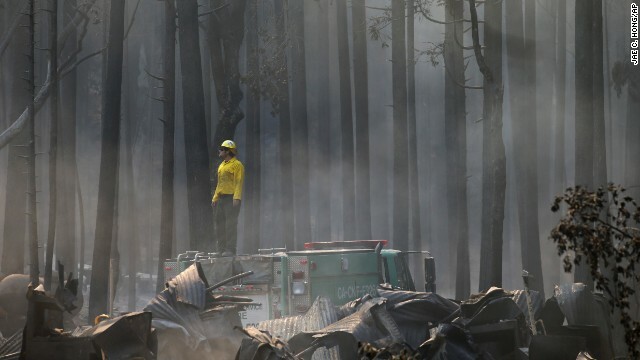 A firefighter stands on top of a fire truck at a campground destroyed by the Rim Fire near Yosemite National Park on August 26. The massive wildfire grew during the week and became the 5th largest in state history, state fire authorities said. 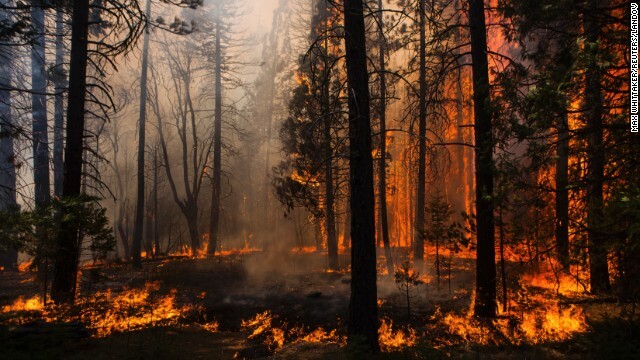 Flames from the Rim Fire destroy trees on Sunday, August 25, near Groveland, California. 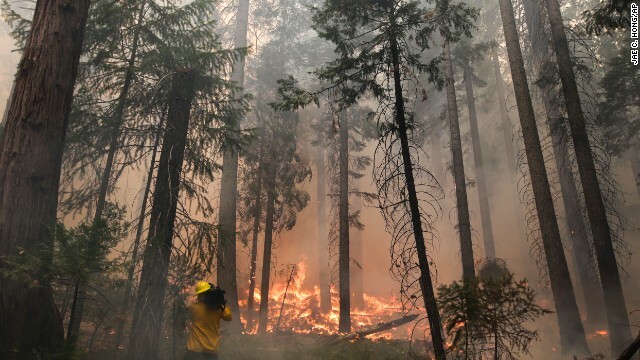 The fire had consumed nearly 219,000 acres as of Saturday, August 31. U.S. Fish and Wildlife Service firefighter Corey Adams sits on a tree stump as he monitors the Rim Fire near Groveland on August 25. 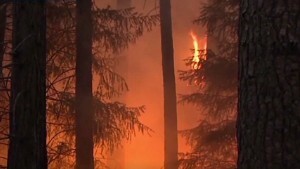 Fierce flames from the Rim Fire burn near Groveland, not far from Yosemite National Park. 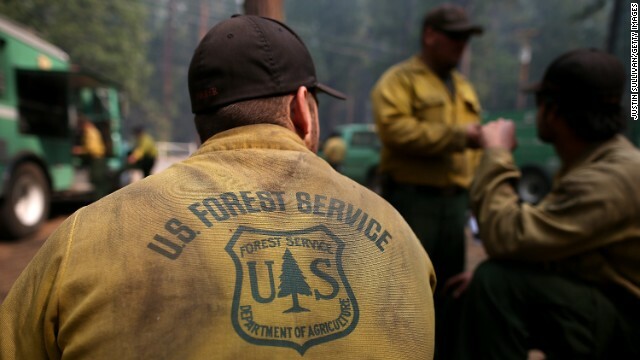 U.S. Forest Service firefighters take a break from battling the Rim Fire at Camp Mather on August 25. Trees burned by the Rim Fire stand charred on August 25 in Yosemite National Park. 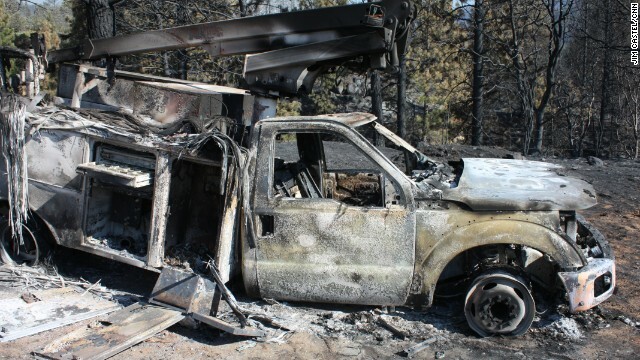 A burned car sits on the side of the road near Groveland on August 25. 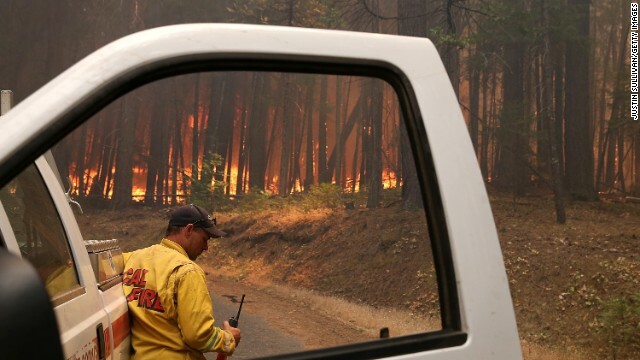 A Cal Fire firefighter monitors the Rim Fire as it burns through a stand of trees near Groveland on August 25. 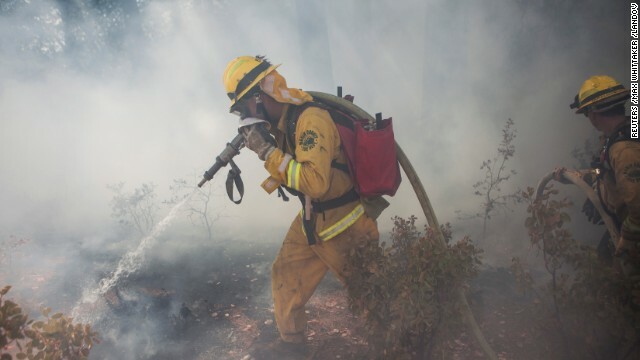 A firefighter douses flames of the Rim Fire in Groveland, near Yosemite National Park, on Saturday, August 24. The Rim Fire burns just outside Yosemite on August 24. 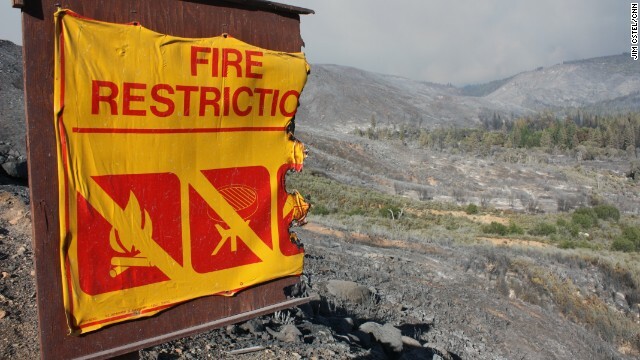 A top priority is stopping the fire from spreading further into the national park. Smoke and flames move along a ridge just outside Yosemite National Park on August 24. 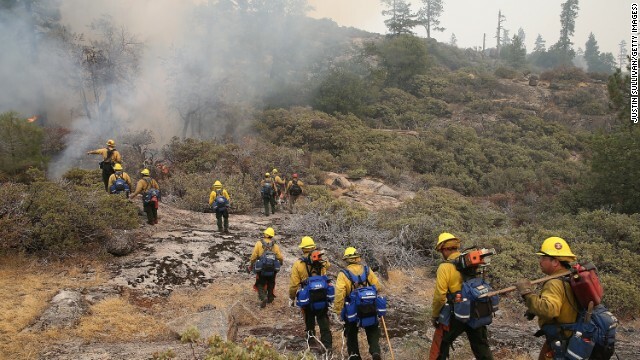 El Dorado Hills firefighters work to douse a hotspot in Yosemite National Park on August 24. 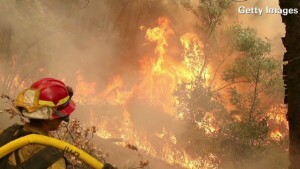 Nearly 5,000 firefighters are attempting to bring the fast-moving fire under control. 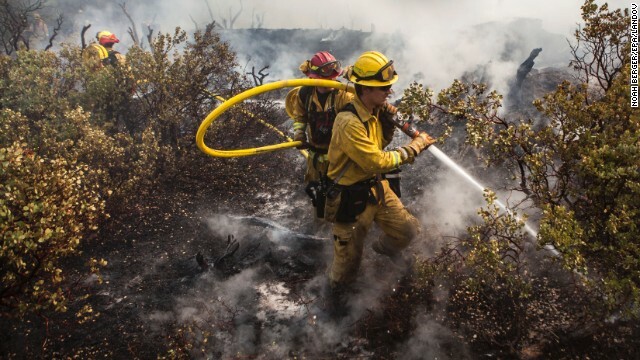 A firefighter douses a spot fire, as he battles the Rim Fire near Yosemite National Park in California. Firefighters move in to douse a spot fire on August 24. 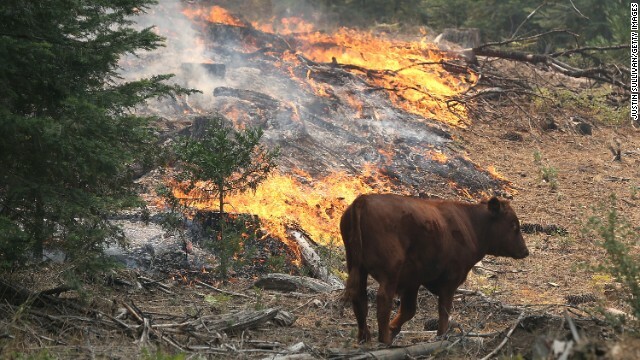 A cow walks through a section of forest that was scorched by the Rim Fire outside of Camp Mather on August 24, near Groveland, California. 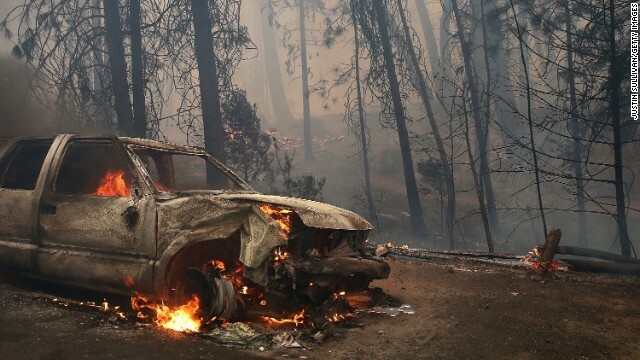 A truck sits scorched outside of Yosemite National Park on August 24. 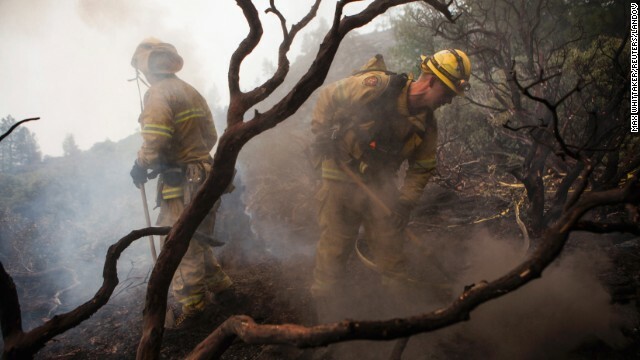 Some 2,600 of firefighters were battling the out-of-control Rim Fire on August 24. Smoke and flame blot out the horizon as the Rim Fire approaches Yosemite Lake near Groveland, California on Friday, August 23. Charred siding is all that remains of a building consumed by the fire. Flames eat up trees as the fire continues to burn out of control on August 23. 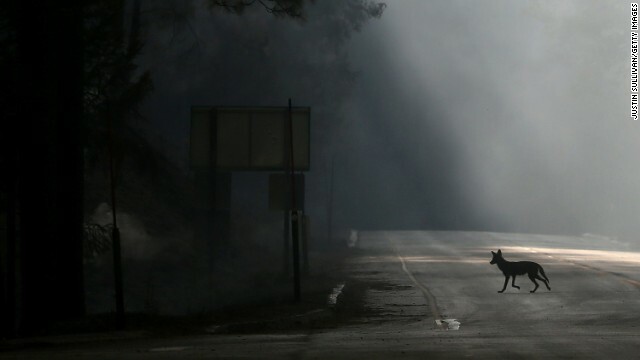 A coyote walks across U.S. Highway 120, shut down due to the fire, near Groveland, California, on August 23. 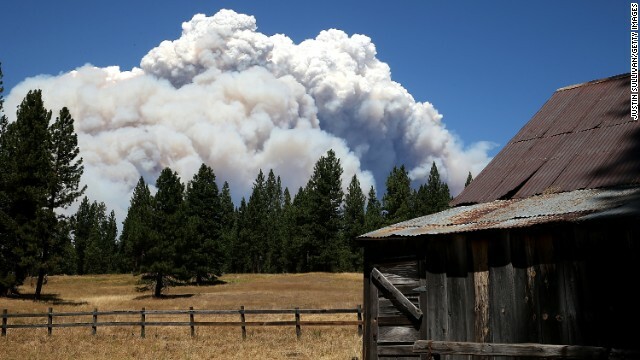 Smoke from the Rim Fire is seen near Hardin Flat outside Yosemite National Park on August 23. 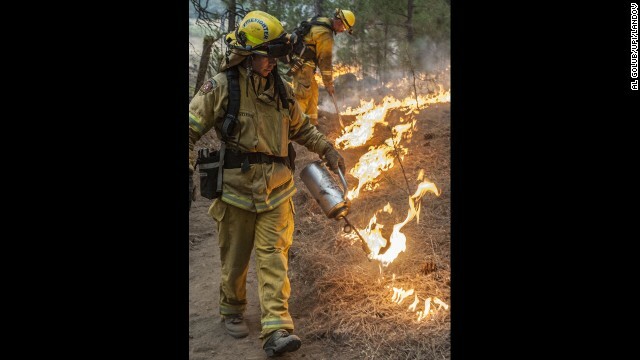 A firefighting crew puts out a spot fire that jumped a fire line in Yosemite National Park on August 23. Giant plumes of smoke rise up from the Rim Fire near the border of Yosemite National Park on August 23. 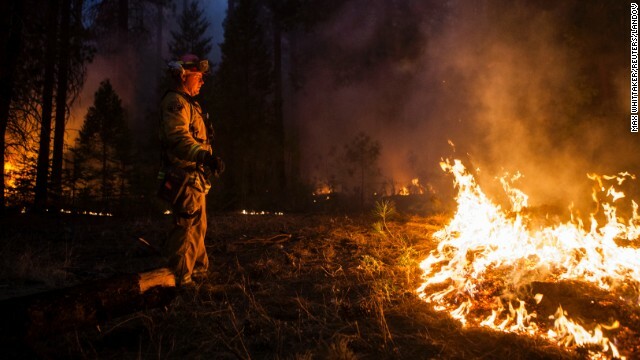 A firefighter from Cosumnes Fire Department monitors a back fire while battling the Rim Fire on August 22, in Groveland, California. 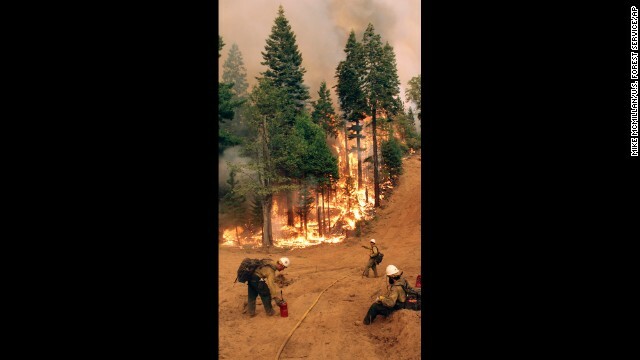 The Rim Fire has burned 105,620 acres, spreading from Stanislaus National Forest to part of Yosemite, Forest Service on Friday, August 23, spokesman Bjorn Fredrickson said. An air tanker drops fire retardant on a ridge ahead of the advancing Rim Fire on August 22, in Groveland, California. 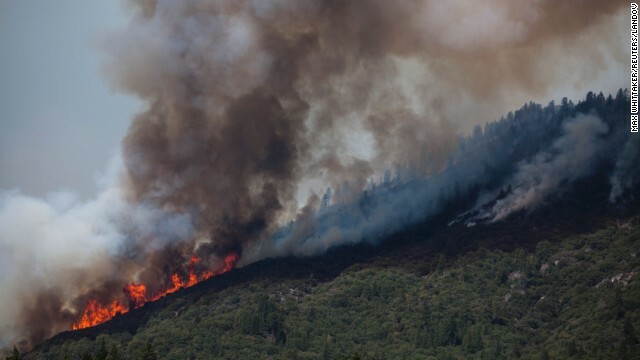 The Rim Fire continues to burn out of control and has entered Yosemite National Park. 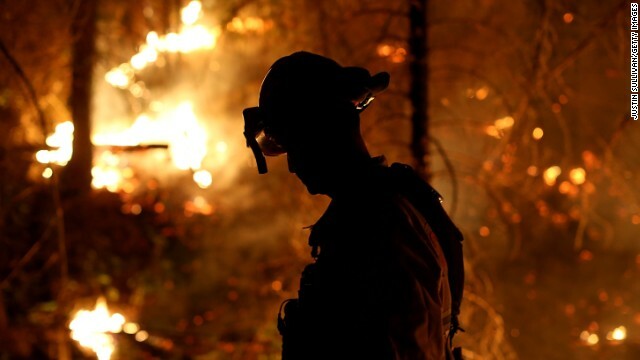 A firefighter from the Colorado-based South Arkansas Fire District carries a hose as he monitors the Rim Fire on August 22, in Groveland, California. 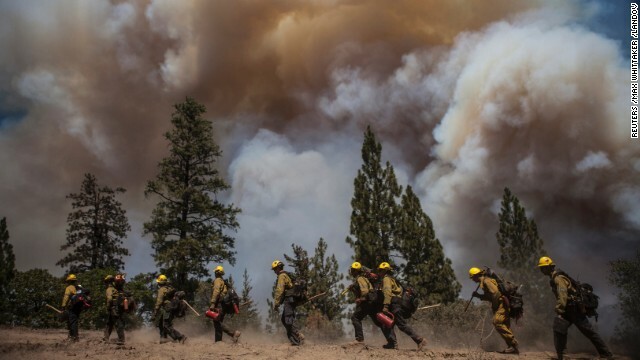 Los Angeles County firefighters hike in on a fire line on the Rim Fire near Groveland, California, on August 22. 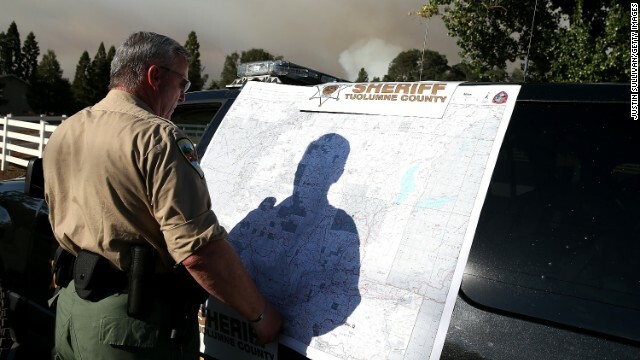 A Tuolumne County sheriff's deputy looks at an incident map of the Rim Fire on August 22, in Groveland, California. 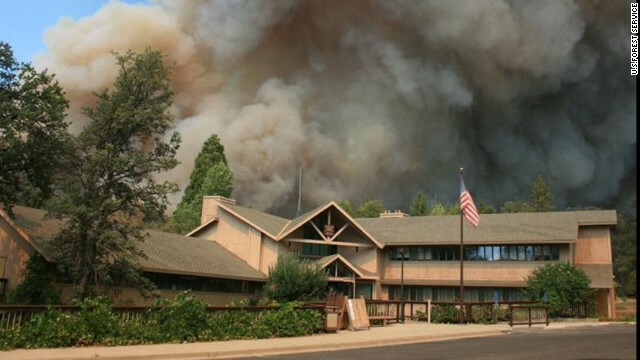 The Rim Fire burns close to Groveland Ranger Station near Yosemite National Park, California, on August 22. A Marin County firefighter works to put out a spot fire that jumped a fire line on the Rim Fire near Groveland, California, August 22. 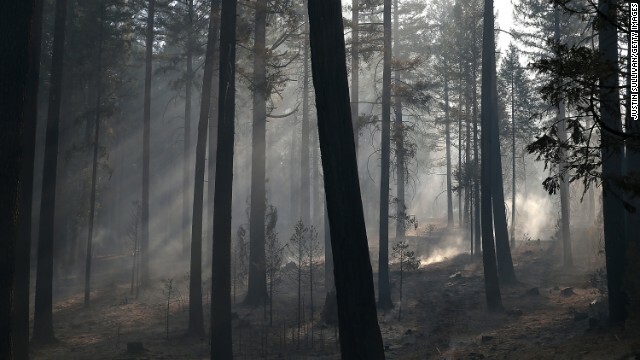 Sunlight filters through smoke in a grove of trees burned by the Rim Fire on August 22, in Groveland, California. Smoke from the Rim Fire is visible near the Hetch Hetchy Reservoir on August 22, in Yosemite National Park, California. 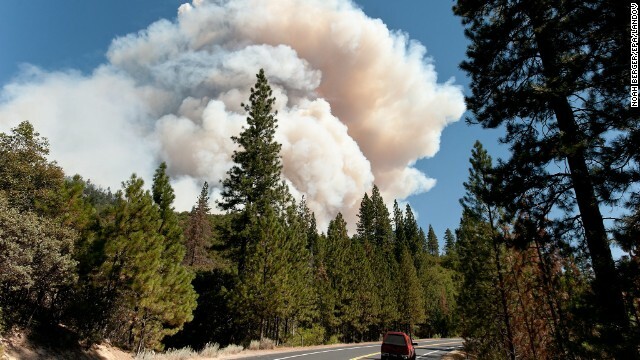 The Rim Fire continues to burn out of control and entered Yosemite National Park on Friday. Are you affected by the fire? Please share your images and footage if you can do so safely. 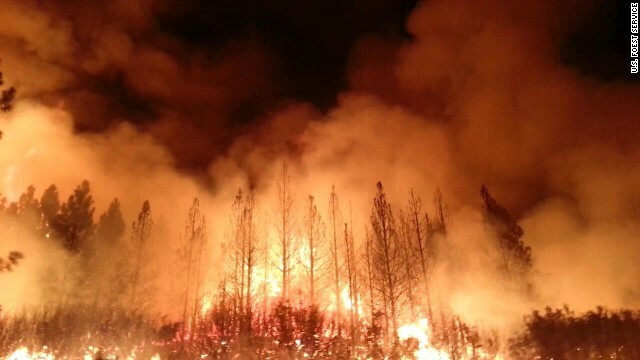 Yosemite National Park, California (CNN) -- The numbers are staggering and the prospects are scary as a still-growing California wildfire menaces Yosemite National Park and San Francisco's water supply. The tourist hotspot Yosemite Valley and its iconic attractions, including the El Capitan rock formation, currently are safe, miles from the Rim Fire's reach. However, the blaze was on the edge of the Hetch Hetchy Reservoir, which serves 2.6 million customers in the Bay Area. Water quality remains unchanged, despite ash that has fallen on the 459-square-mile reservoir, because the water is drawn from a depth of 260 feet, according to the San Francisco Public Utilities Commission. The city was already transferring 275 million gallons of water daily from Hetch Hetchy to other reservoirs because Hetch Hetchy is full, but as a precautionary measure, the city increased that amount by 27 million gallons, a Tuesday statement said. The commission said it was confident the Rim Fire would not affect the reservoir: "Due to the rocky, granite terrain and limited brush along the perimeter of the reservoir, there is little risk for direct water quality impacts." The fire could threaten the area's hydroelectric generators, which provide much of San Francisco's electricity. 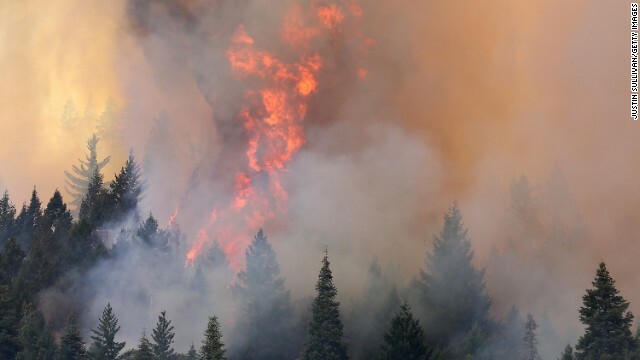 Because of the approaching flames, officials shut down the generators, and the city -- more than 120 miles to the west -- temporarily is getting power from elsewhere. "All of San Francisco's municipal electric customers continue to be fully supplied; there will be no interruption in electric service," the commission said. 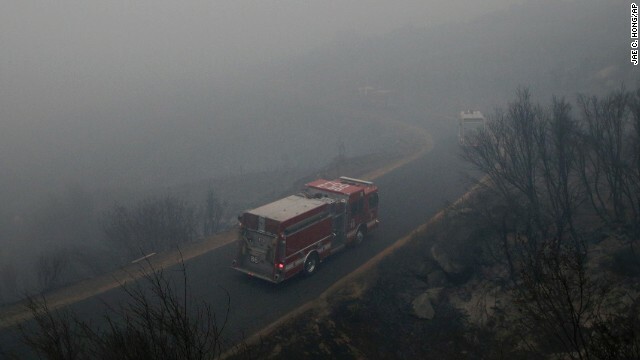 The Rim Fire, which has devoured about 184,000 acres, was still only 20% contained as of Tuesday evening. 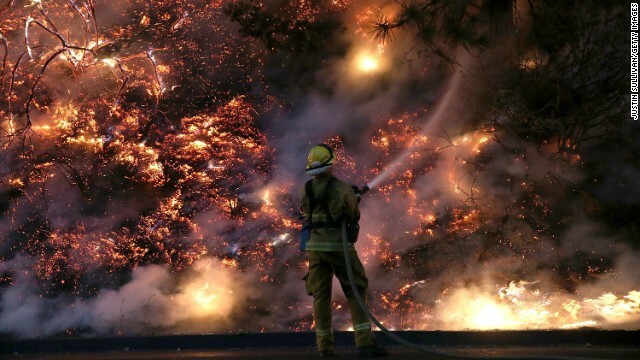 It is the seventh largest blaze in California's recorded history. 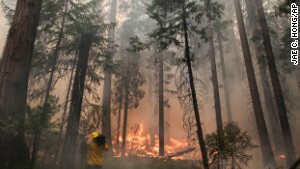 "There's a lot of concern, and there's a lot of work to be done," U.S. Forest Service spokesman Lee Bentley said. 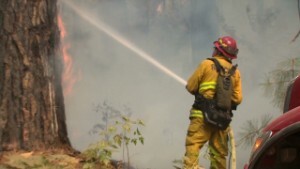 Firefighters on Tuesday were able to build fire lines in several locations. 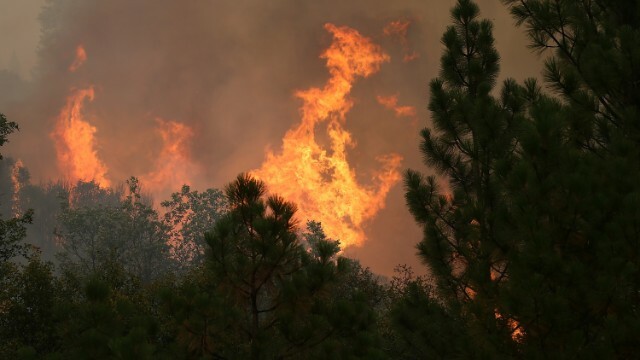 Evacuations were ordered south of Highway 120, north of Old Yosemite Road and along the Highway 108 corridor between Tuolumne City and Pinecrest. "Access and difficult terrain remain concerns for crews and equipment," said an incident report. 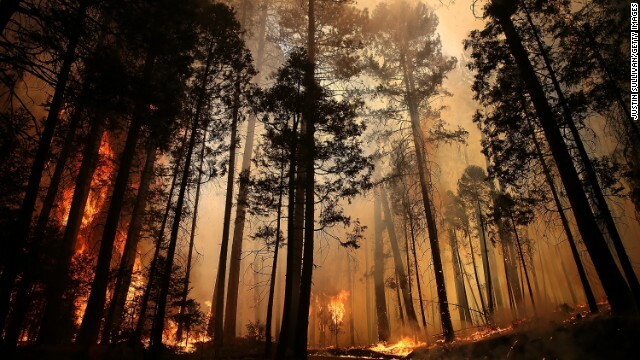 "Rapid fire growth and extreme fire behavior are hampering suppression efforts." 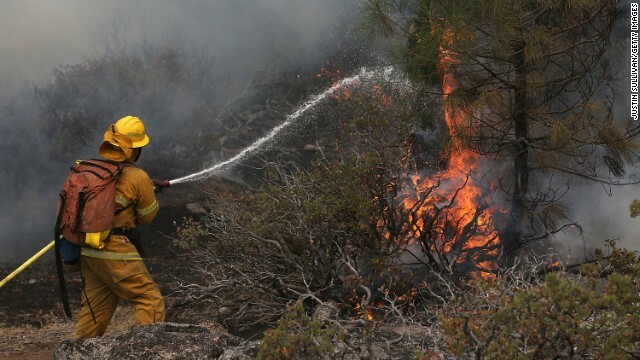 As many as 20 helicopters and DC-10 and C-130 air tankers were aiding the efforts of 3,800 firefighting personnel. 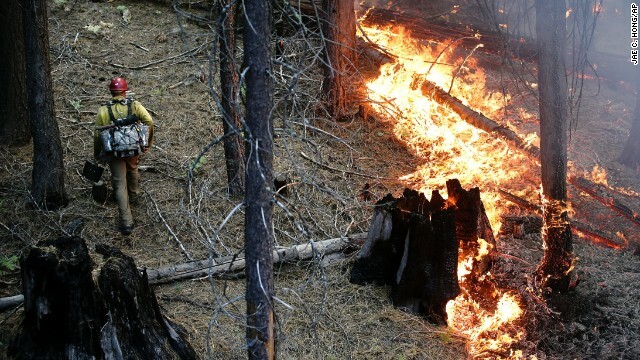 A top priority is stopping the fire from spreading farther in Yosemite National Park. A portion of Tioga Road in the park will be closed for several days beginning Wednesday so that firefighters can perform fire suppression. 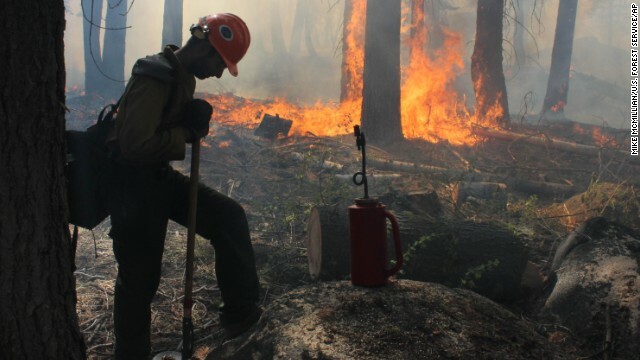 "The work that will be performed over the next few days is instrumental in suppressing the Rim Fire within Yosemite. The safety of the firefighters working along the road is our paramount concern," park Superintendent Don Neubacher said in a statement. Tamarack Flat and Yosemite Creek campgrounds, both located along Tioga Road, will remain closed. Yosemite, with hundreds of campground sites and lodging units, had nearly 4 million visitors last year, the National Park Service said. The park typically has 15,000 visitors on a busy summer weekend. 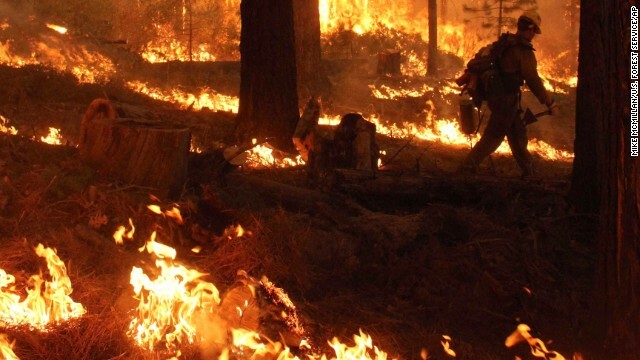 While the Rim Fire has consumed at least 12,000 acres in the northwest section of the park, it has had little or no direct impact on Yosemite Valley, a popular spot for tourists and home to many of the famous cliffs and waterfalls in the park. The park has closed a few roads, campgrounds and wildlife trails while restricting smoking and building camping or cooking fires in wilderness areas. 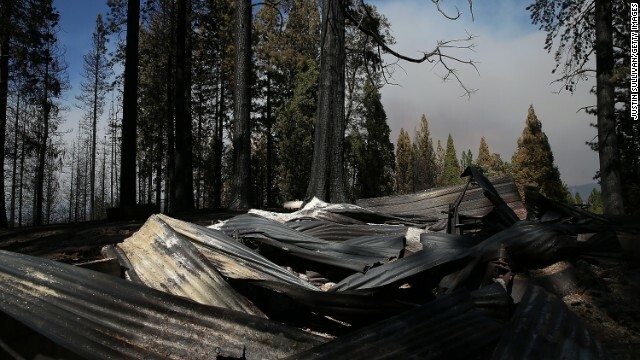 About 5,500 structures, many of them vacation homes, were under threat, according to InciWeb, a federal website that collects information from agencies such as the U.S. Forest Service and Bureau of Land Management. The fire has cost more than $20 million, Bentley said. Thirty-one residences and 80 outbuildings have been destroyed. The inferno threatened the Yosemite gateway communities of Groveland and Pine Mountain Lake just outside the Stanislaus National Forest. "Business is slow, very slow," said Corinna Loh, owner of the Iron Door Saloon in Groveland. Her normal season is Memorial Day to Labor Day. "This is time we manage to save up money to make it through the winter, so it's really scary for all of us," she said, sitting among empty tables. 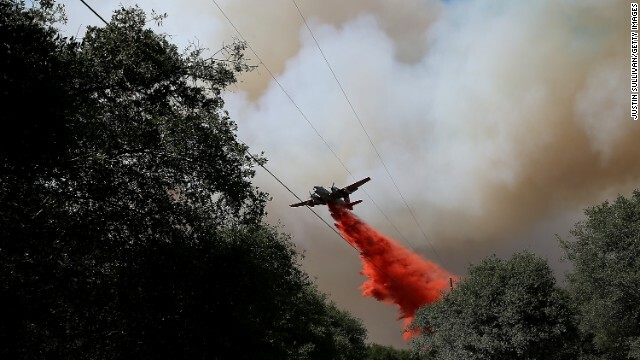 The Tuolumne County Sheriff's Office, meanwhile, issued evacuation advisories for the town of Tuolumne and nearby Ponderosa Hill, InciWeb said. It was not clear how many residents were covered by the evacuation advisory. 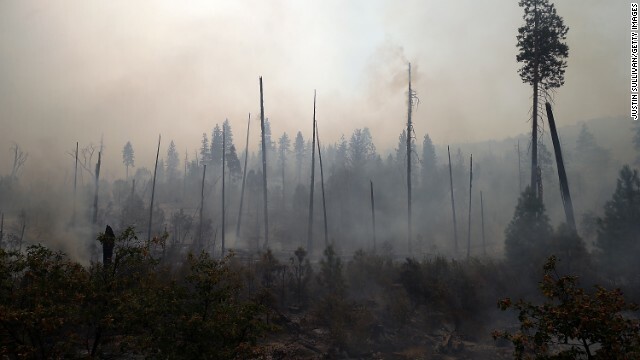 Authorities say the Rim Fire started on August 17. The cause is under investigation. 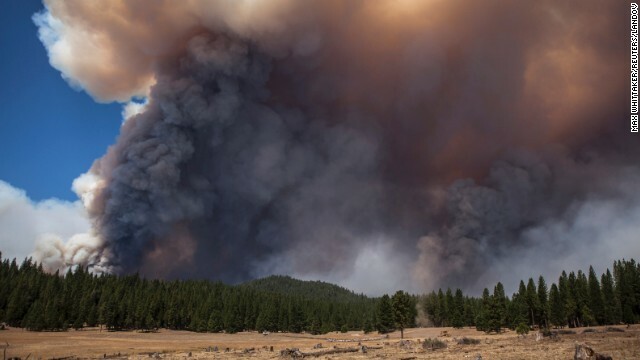 CNN's Nick Valencia and Gary Tuchman reported from Yosemite National Park, and Ed Payne and Eliott C. McLaughlin reported and wrote in Atlanta. CNN's Amanda Watts contributed to this report.